By swiping your Merchants Bank debit or credit card you can help maximize the amount of money Merchants Bank gives this year to local food shelves. What is Swipe Out Hunger? 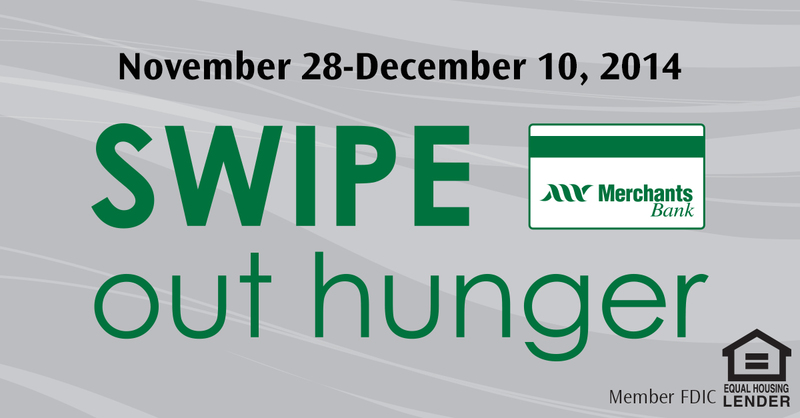 Swipe Out Hunger is a Merchants Bank initiative to support local food shelves in our communities. Food shelves are nominated by our branches and receive a donation based on the number of votes cast through our Facebook page. The total possible donation will increase by 5 cents each time our customers swipe their Merchants Bank debit or credit cards between November 28 and December 10, to a maximum of $10,000. Give $5,000 to the top vote getting food shelf. Give a percentage of another $5,000 to all other nominated shelves based on their percentage of votes. In order to achieve both goals, we need to reach 200,000 swipes (purchases made with a Merchants Bank debit or credit card) by our customers between November 28 and December 10. Use your debit or credit card to increase the total amount of money Merchants donates. Like the Merchants Bank Facebook page and cast your vote for your favorite local food shelf. You may vote up to three times per day. Which food shelves are participating? This entry was posted in Community Events, Current News and tagged community giving, Merchants Bank, nonprofit support, Swipe Out Hunger. Bookmark the permalink.